Similar to a 2013 sighting of the same tour, we now get a new image of John Mayer’s pedalboard. No news on what is, if anything really, in his racks, which at last count he used four different ones to contain all of his rack effects. 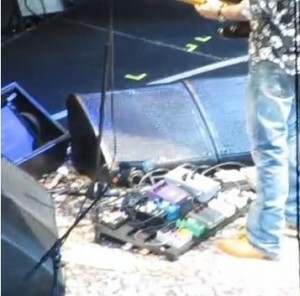 During this tour, John also took the time to add some new pedals to the mix. Most notable is the Q-Tron envelope filter by Electro-Harmonix, though the Peter Cornish TES and Ross Phase/Distortion are also new.